A partnership between Thorpe House boys’ school in Gerrards Cross and Seriously FUN Swimming Schools saw the completion of a much anticipated indoor swimming pool! On Wednesday 30th January 2019, Thorpe House School and Seriously FUN Swimming Schools celebrated the launch of the school’s newly covered and renovated 18 metre swimming pool with an official ceremony. Despite the freezing temperatures and threat of snow, the event was well attended; guests included school governors, directors, staff and parents from both Thorpe and Seriously FUN plus the senior Head Boy and a selection of the school’s elite swimmers. The star guest however was Olympic gold medal winner Adrian Moorhouse MBE. 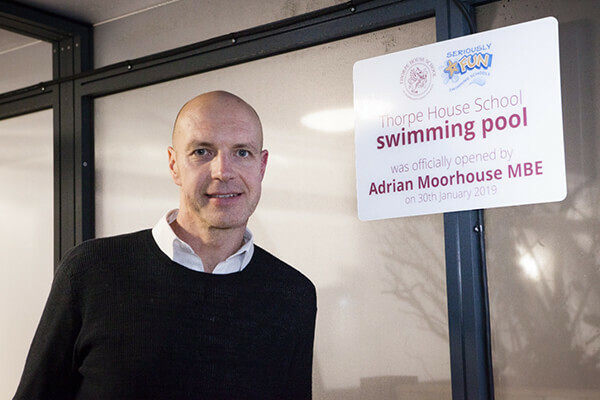 Adrian, who lives in Cookham and is a long time Seriously FUN customer, performed the ribbon cutting ceremony and talked about how the pool will benefit pupils at Thorpe House, Seriously FUN customers and the local community. “At Thorpe we have a number of swimmers who compete at a high level; now we can play a much bigger part in their continuing development as we are able to train them throughout the year, whereas before we were only able to train during the summer term. Parent feedback has been really positive; those with younger boys are delighted their sons can now enjoy year-round swimming lessons during the school day, in familiar surroundings and with our experienced teachers. As PE teachers this also means we can be there at the start of their swimming journey and can identify swimmers that show extraordinary talent, but also those that are less confident and need extra help. In addition to school swimming lessons, the pool will be used for GCSE classes, elite team training and galas”. Seriously FUN approached Thorpe House in 2017 to fund the building of an enclosure to cover their existing outdoor school swimming pool. In the 1980s, there were an estimated 3,000 school swimming pools, those numbers have dwindled by one third, and are being lost at a rate of 10 per cent a year, according to the *Amateur Swimming Association. 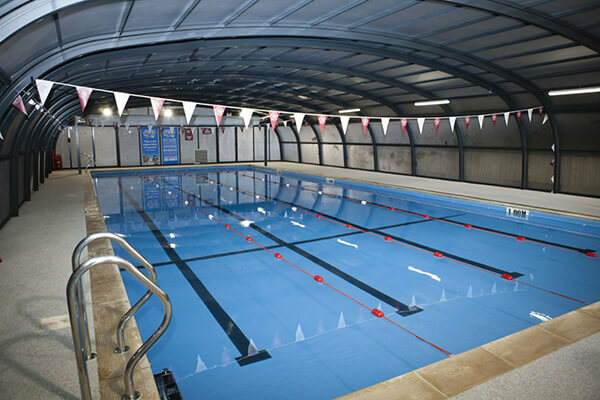 “It has been an absolute pleasure working with Thorpe House School to create this fantastic new swimming facility. The partnership provides ongoing income for the school by way of a long term hire agreement and secures the pool's future at a time when many other schools are closing their swimming pools”. Seriously FUN Swimming Schools offer weekly term time and school holiday lessons for children aged 3 to 12 years from beginners to advanced swimmers. Seriously FUN, a family business founded in 1990 by Janet Madden, teach more than 1,300 children per week essential swimming and lifesaving skills across 13 venues in Berks, Bucks, Surrey, Kent and Sussex. Can anyone use it Baggles? Thanks Baggles, I'll look into it.